New Delhi: Sitting on a plush cream-coloured couch at his home in Gurugram, Major General Gagandeep Bakshi (retd) adjusts his tie, takes the stem of a delicate teacup in his hand, and begins to extol the virtues of military retaliation against Pakistan. For G.D. Bakshi, war is not a diplomatic disaster, but an inevitable price Pakistan must pay for being a “pagal kutta”. “A rabid dog that goes around biting everybody,” he tells Defensive Offensive, a news portal, shortly after we leave. And the call is not entirely political — Bakshi lost his brother, Captain Srishthi Raman Bakshi, in a mine explosion during the India-Pakistan War of 1965. The Captain was only 23 years old at the time. “His entire body was shattered to pieces in that mine blast. People collected whatever was left and burnt his body then only. Then they gave us urn with the ashes, saying ‘here, this is your brother’,” Bakshi tells ThePrint. Five decades, an illustrious career in the army, a PhD in military history, and two grandkids later, Bakshi’s quest for revenge has not mellowed. Rather, it has metamorphosed into another form — rabid rhetoric on television. Nowadays, whenever the media needs a defence expert to cry war on Prime Time television, Bakshi is inevitably the man for the job. You can find him wagging a self-righteous finger on your television every other night, his gruff voice reaching a breaking point as his temper rises and his nostril flares. While he is synonymous with Republic TV, where he is an ever-present fixture, Bakshi has been making appearances elsewhere too. Three weeks ago, his theatrics were on display in the ABP newsroom. “How many casualties will we suffer? For 30 years we have tolerated this in silence, 30 years!” he can be heard screaming during a debate after the 14 February Pulwama attack. “Pakistan will pay a heavy price for their unholy actions. I can promise you this. Agar Pakistan ko Mahabharata chahiya, toh woh ho ke rahegi! (If Pakistan wants a war, then they will get one),” he adds. In January this year, while speaking at a conclave on Article 35A, regarding ‘permanent residency’ in Jammu and Kashmir, Bakshi spoke on the situation in the state. “I want their top commanders,” he says. “I particularly want those Pakistanis who have come into my country without a passport or visa. Yeh koi randi khana hai? (Is this a whorehouse),” he yells into a reverberating microphone. “Yeh koi randi khana hai! ?” he shouts again. A week ago, as Bakshi sat on a panel in conversation with News Nation’s senior correspondent Ajay Kumar, a debate on alleged Pakistan-sponsored terrorism descended into the retired army general shouting, “Screw you! This isn’t about Pulwama. All of this, say some of those who know him, is part of the problem behind the retired general’s hawkish posturing. That he makes an impression on an audience is also due to his credentials. Bakshi has seen more war, insurgency and terrorism than even an average Armyman — he was at the China front during 1971, in Punjab at the height of militancy in 1985, Kaksar in Kargil in 1987, Kishtwar, J&K, in 2000. His war-time experience has earned him both the Sena Medal and the Vishisht Seva Medal for his service. If that wasn’t enough, service in Kashmir is a family legacy. His father, S.P. Bakshi was the chief education officer of the Jammu & Kashmir State Forces (6 J&K Rifles), and his brother lost his life while serving in that regiment. Bakshi says he joined the forces against his father’s wishes — who wanted him to be an IAS or IFS officer — and was commissioned into the very same 6 J&K Rifles. His military experience, however, isn’t merely restricted to the battlefield. He was a member of the Military Operations Directorate — a planning body directly under the supervision of the Chief and Vice Chief of Army Staff. In the Ministry of Defence, Bakshi helped plan the Indian Peace Keeping Force operations in Sri Lanka before he was sent to Siachen when tensions in the Kashmir Valley heated up. For Bakshi, the horrors of war are real. He says that he has seen the bodies of soldiers tortured to death by Pakistani terrorists who “receive continuous refuge from the state”. When he talks of men dying at the border, he does not access a theoretical framework, but a lived one. All of this, however, suggests the retired army man quoted above, shouldn’t cloud the judgement of Bakshi’s views. Away from the glamour and aggrandisement of the TV spotlight and in the comfort of his Gurugram home, Bakshi’s views appear more tempered. He says “communalism, of course, is bad”, and that “nobody is forcing you to watch any particular media channel”. But he also insists that Mughal rule in India was akin to Muslim colonialism by “our enemy for eight centuries”. As we wait in his Gurugram home, three young students from Delhi University (DU) sit with a laptop next to the retired officer. One of the boys mentions forming an “Azad Hind Sena in every Delhi college,” paralleling that set up by Netaji Subhash Chandra Bose during the freedom struggle. Bakshi says that “it’s a great idea” and that “just as the NCC (National Cadet Corps) wears a uniform, Azad Hind Sena should have a uniform in every damn school and college”. “I’ll invite ex-servicemen to deliver lectures on military history, strategy and give you training — you can learn judo, karate and other forms of defence. As long as they’re willing to say ‘Jai Hind’, Hindu, Sikh, Musalman, doesn’t matter,” Bakshi says. For Bakshi, the distinction between a good and bad Muslim is clear — the faultline balancing on allegiance to Bharat Mata. Muslims in the Azad Hind Sena and Muslims who denounce the Mughal period are good Indians, but the rest, aren’t Indian at all. On the alleged human rights violations by the Indian Army in Kashmir, he says the stone pelters are “them”, who deserve “no special treatment than the rest of the country”. He makes his case by attempting to draw a parallel between pellet gun victims in Kashmir and the rioters who died in the Dera Sacha Sauda protests (in Chandigarh) “here in Hindustan”. Through the course of the conversation, Bakshi tells ThePrint that he is not just a “screaming Armyman”. Bakshi then goes on to explain that after studying the Transfer of Power Archives in London, he was shocked to learn that a letter signed by the Viceroy of India, the Field Marshal, the Commander in Chief and the director of the intelligence bureau at the time, proved without doubt that “Mahatma Gandhi’s Quit India Movement had failed”. “We never got freedom from non-violence,” he says. His downplaying of the Quit India Movement isn’t without reason. Bakshi is an ardent admirer of Subhash Chandra Bose — the army veteran is both a trustee of the Netaji Bose INA Trust and has written a biography of Bose, the Azad Hind Fauj and the INA, which he once told Republic World, “was really responsible for forcing the British to leave”. But Bakshi, who has also reportedly served as the deputy director of the Vivekananda International Foundation, alongside NSA Ajit Doval, hasn’t always had his finger on historical facts. In February, he was responsible for spreading the fake news that the Pulwama attack was only possible due to a 2014 incident in Budgam, in which security forces were ordered to not stop vehicles at checkpoints on the Srinagar highway. Bakshi blamed Mehbooba Mufti of the Peoples Democratic Party (PDP) for the directive, failing to realise that she wasn’t the chief minister in 2014 — Omar Abdullah of the National Conference was. Further, the Indian Army had addressed the Budgam incident shortly after it happened, and their version was quite different from the one general Bakshi was describing. In what was described as a “hate-mongering lecture” by an IIT Madras student in 2016, Bakshi also reportedly said that “Dehradun was originally called Dehradrone, as Dronacharya’s camp was set there… In its spot, the Indian Military Academy has come up”. Student Abhinav Surya, who wrote a complaint letter to the IIT director about Bakshi’s speech, told the media that the Major General’s contention was “an instance of distorting history”. According to those who knew him, Bakshi’s “temper streak is not new and has been with him for decades”. A former student of his at the Indian Military Academy during 1978-79 recounts instances where general Bakshi “threw a duster and chalk at one of the cadets who had dozed off in his history class”. “He started by calling him an idiot and the abuses increased to the range of madarc**d and behenc**d. Although, he later did apologise that he shouldn’t have lost his temper,” the former student added. In today’s world, Bakshi stands at the crossroads of two increasingly divergent worldviews — the liberals and the orthodox — and has built himself a boat on this Right-wing wave. As he says, “you aren’t forced to watch the channels” you do, before going on to defend’s Republic TV’s controversial anchor Arnab Goswami. The copy has been updated with Bakshi’s comments at a conclave on Article 35A in January this year. 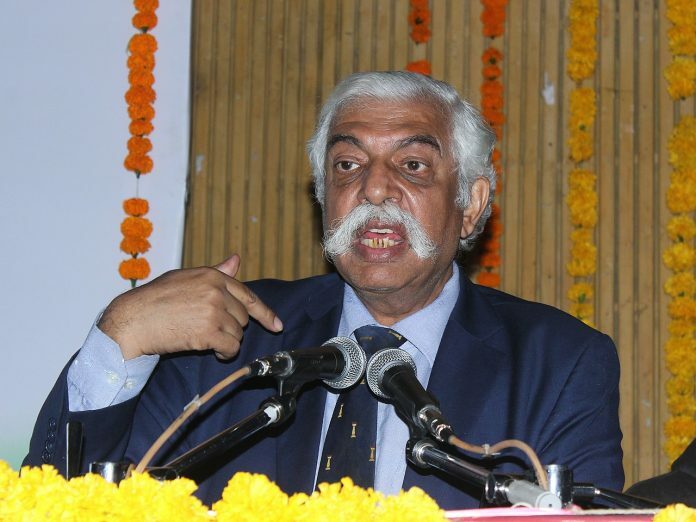 I can describe the Stature of Gen Bakshi amongst jawans by sharing the above two links.. Whether the author had a bias is not an issue – as it presents Maj Gen GD Bakshi as he actually conduct himself. While his raving and ranting and screaming may seem like good entertainment or even appeal to a jingoistic public, and also get him prime time appearances ( with associated renumerations), what he is does tends to portray all officers as caricatures. In reality, very few Army officers are like him. Many are cerebral, sober, objective, responsible, deep-thinking cool-headed and rational individuals who deeply care about the lives of the men u det their command . Question is : can one trust such a theatrical, unstable, perpetually enraged person to take rational decisions under combat conditions? And BTW – his profile is not exceptional – I could name a thousand officers with similar / near similar service profiles. It is an absolutely horridly written article. While it may be increasingly difficult to maintain a non-partisan viewpoint at times, but the author’s own judgement has hampered the way the article is framed. It is highly cynical, poorly articulated and shows the author’s high-handedness in passing her own judgement – tenets that should not befall journalists working on such a well-respected platform. It’s not The Wire is it?